Over the past two years, this blog has allowed me to learn about what could arguably be considered one of America's most overlooked and understated regions. Clearly, Rochester has many imperfections, some in obvious places (i.e. the center of the metro area), helping to cement a perception that has been far from optimal. Yet some extremely low-grade research, as has been performed on this site, reveals a possibility that was thought by many to be impossible: Rochester's best days are still ahead of it. The formula of a few jobs, continued downtown development, and shameless optimism is transforming Rochester, and the Rochester of 2025 might barely resemble the Rochester of 2010, the year of my family's arrival. In fact, the transformation is already quite obvious, making this site, which aims to bridge perception and reality, less necessary. I truly appreciate the (small) readership over the past two years. Rochester is full of remarkably intelligent and passionate people, and I was honored to have a tiny sample of this group appreciate this voice. While the site will no longer be updated, I hope that it can continue to serve as a place to find true facts (as opposed to alternative facts) about this great region. In the near future, my time will be devoted to the standard tasks of raising children and holding a job, both of which I've learned can be surprisingly time consuming. Great pride comes with discussing Rochester's assets and accomplishments (museums, breweries, schools, Finger Lakes, inner loop removal, etc.). 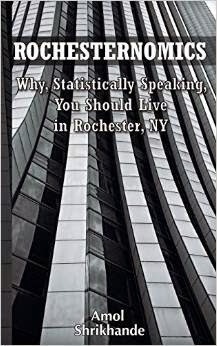 At times, Rochester can be remarkably irritating (repeated discussions about Kodak, the train station (shack), the Family Dollar store next to the empty garage type thing on Main Street, etc.). After some time away from Rochester, a strong desire to reconnect develops. Something about Rochester demands taking abundant photographs. Making fun of Rochester is fair game, unless a non-Rochesterian is making the jokes. After years of knowing Rochester, you got to admit that he/she is a really good kid.